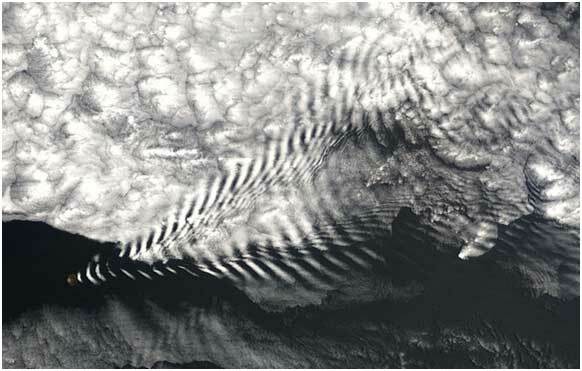 When people think of waves they often look to the oceans, but waves can also be found high in the sky. In this picture Amsterdam Island in the Indian Ocean made waves in the clouds. These types of clouds are commonly referred to as wave clouds and are standing waves that form when stable moist air flows over a mountain or a range of mountains. In the case of this picture, when stable moist air flows over an island. When air travels over a mountain, a hill, or an island, like in the picture, clouds often form. Air masses rise as they travel over the island, the temperature decreases and the water vapor in the air condenses, forming clouds which appear on the downwind side of the island. As the water vapor sinks with the wave the cloud evaporates back into water vapor, creating the dark lines between the clouds. Es una adaptación promovida por la Real Sociedad Matemática Española (RSME), como una de las diversas iniciativas para celebrar su Centenario.